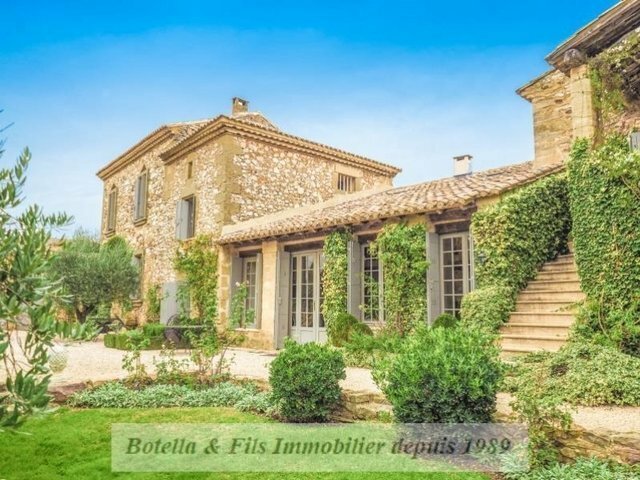 A few minutes from the Uzes Duchy, this property has been given a high quality and careful renovation. The 1900m² south-facing garden is walled and landscaped and enhanced by a secured, heated swimming pool with a summer kitchen/entertaining area. On the ground floor, three light-filled living areas: a living room of 55m² with fireplace, cathedral ceilings and mezzanine; a top quality kitchen of 23m² and a 35m² dining room with fireplace. The upstairs area comprises a grand air-conditioned bedroom suite with private bathroom, dressing room and study. A second bedroom suite with private bathroom and toilet, two further bedrooms, bathroom and toilet. In the attic area, a television room or games room of 35m², a bedroom with toilet and washbasin, a second double bedroom with bathroom. Splendid vaulted wine cellar. Agency fees to be paid by the vendor. An exceptional property selected by Botella and sons (since 1989). Ref: 10254.